The sickness and death of Rev. Imbunda Sefulo Kakoma came as a shock to the family, friends and the church at large. He left his Mongu home for the WCF Presbytery Conference which was held in Livingstone at Linda Secondary School from 21st to 25th August 2014. Late Rev. Kakoma on Sunday before he fell sick. On 24th August, Rev. Kakoma who was also Western Presbytery Secretary, made the notices and announcements as on any other Presbytery event. He had lunch with fellow church workers and was able to interact with a number of old friends and family members. After lunch he was scheduled to shift camp from WCF Conference to Synod Ministers’ Symposium which was to begin on 24th August at Livingstone Institute for Business and Engineering Studies (LIBES) in Livingstone. Whilst in the company of Rev. 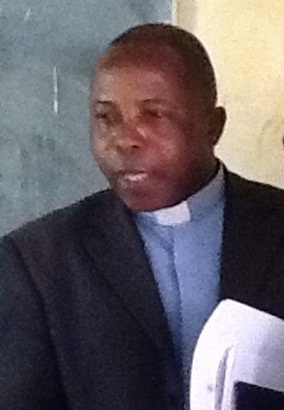 Josphat Sinkala of Sesheke and Rev. Wezi Manda of Mwandi, before leaving the guest house where the trio were accommodated, Rev. Kakoma showed signs of stroke. He was then rushed to Maramba clinic where he was further referred to Batoka Hospital without any delay. Admitted for observation on Sunday at Batoka, Rev. Kakoma was then referred to Livingstone General Hospital ICU the following day on Monday 25th August. This was another shock, especially to the family. Church Ministers that gathered in Livingstone, led by Synod Bishop and General Secretary, and Presbytery Bishops interceded and took turns to visit the Presbytery Secretary. Equally the family and church members did the same. The following week on Thursday 4th September, without any word to the family and the church, Rev. Kakoma died in the Livingstone General Hospital around 23:00 hours. His send-off church service from Livingstone was held at UCZ Coillard Memorial Congregation on 6th September 2014. Rev. Bishop Mutanuka of Southern Presbytery gave the homily entitled “Take care of God’s work and God will take care of your soul”. On Sunday 7th September, a combined team of Ministers, Deaconesses, family and church members from Livingstone, Mwandi and Sesheke transported the body of the late to Reverend to Mongu. Upon arrival in Mongu, the funeral entourage was given a solemn and touching welcome, as congregants from Mongu based Congregations clad in their uniforms lined to receive the body of their Minister. Rev. Kakoma was then put to rest at UCZ Sefula Mission grave on Monday 8th September, after a final service to celebrate his life was held at Mulambwa Congregation where he served as Congregation Chairperson. The Synod Bishop Rev. Mutale Mulumbwa preached during the church service, and a good number of Church workers from Southern, Lusaka and Copperbelt were in attendance. Before his death, Rev. Kakoma once served as a lecturer at the UCZ Theological College (now UCZ University College); as a minister in Southern Presbytery; In Western – Senanga Consistory; Mulambwa in Mongu Consistory; and Presbytery Secretary the position he held until his death. He is survived by a wife and 9 Children. May His Soul Rest in Peace.